When a composer / arranger who hasn't yet turned thirty can enlist the caliber of musicians who are present and accounted for on Musings, the inescapable assumption is that something special is afoot. Upon listening, that appraisal proves to be quite accurate, as young Christopher Zuar (twenty-seven when this debut album was recorded) presents seven of his uncommonly erudite and perceptive compositions (and one, which he arranged, by Egberto Gismonti) that together signal the emergence of an exemplary talent. Zuar, a New Yorker who started his musical career as a trumpet player, later became so fascinated by the art of writing that he entered the New England Conservatory to study composition with one of his muses, the late Bob Brookmeyer. One of his NEC instructors was pianist Frank Carlberg who helps navigate the rhythm section on Musings. Zuar later studied at the BMI Jazz Composers Workshop and earned a master's degree in composition from the Manhattan School of Music, where he studied with Jim McNeely. Those influences and others (most notably Gil Evans and Thad Jones, with an occasional nod to Maria Schneider) are among the many weapons in Zuar's impressive arsenal. 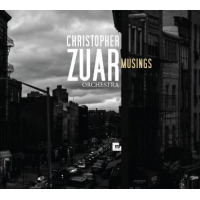 Musings opens, appropriately, with "Remembrance," a picturesque tone poem for which Zuar won the 2012 ASCAP Young Jazz Composers Award. Alto Dave Pietro is showcased there, as is Carlberg on the Bach-inspired, contrapuntal "Chaconne," which follows. For sheer beauty, one need look no further than that. "Vulnerable States," whose introductory passage calls to mind Antonin Dvorak and other Romantics, uses a number of musical devices (including a wordless vocal by Jo Lawry who does the same on "So Close, Yet So Far Away," "Anthem" and Gismonti's irrepressible "Aneis") to convey a sense of uncertainty. Zuar shows his more playful nature on "Ha! (Joke's on You)" whose sunny melody is reminiscent of the old standard "Yes, Sir, That's My Baby." Drummer Mark Ferber and percussionist Rogerio Boccato help keep the rhythm hopping behind sharp solos by trumpeter Mat Jodrell and guitarist Pete McCann. Tenor Jason Rigby is front and center on the wistful "So Close," Ben Kono (oboe) on the sinuous "Lonely Road." Lawry is superb on "Aneis," as are Carlberg and Rigby (clarinet / soprano), while bassist John Hebert, flugel Matt Holman, Pietro (soprano) and Kono (alto) add luster to "Anthem." Zuar's charts are sharp and engaging, the ensemble letter-perfect. In sum, a consistently impressive debut by a young composer / arranger whose future seems as promising as his Musings may allow.